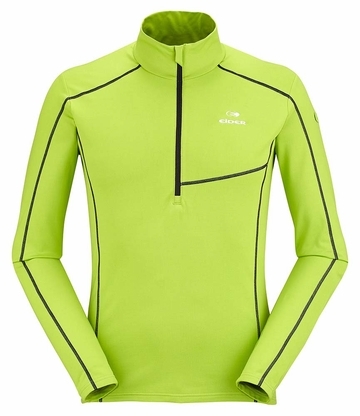 "Sleek outer with a light fleece backing on the inside, the Montana � Zip performs well and looks even better. With a sleek finish on the outside and a light, soft fleece backing on the inside, the classic Montana � Zip performs well and looks even better. The longer cut provides greater coverage, and the breathable, 4-way stretch fabric moves with you during all your favorite outdoor winter activities. Flatlock stitching assures next-to-skin comfort , while the half-zip provides ventilation if needed. >THERMO SOFT ACTIVE // 89% RECYCLED POLYESTER 11% ELASTANE + THERMO SOFT ACTIVE WHITE // 90% POLYESTER 10% ELASTANE "